Lawyer by qualification, Fadil Sareshwala jumped into the binding business to support his father. 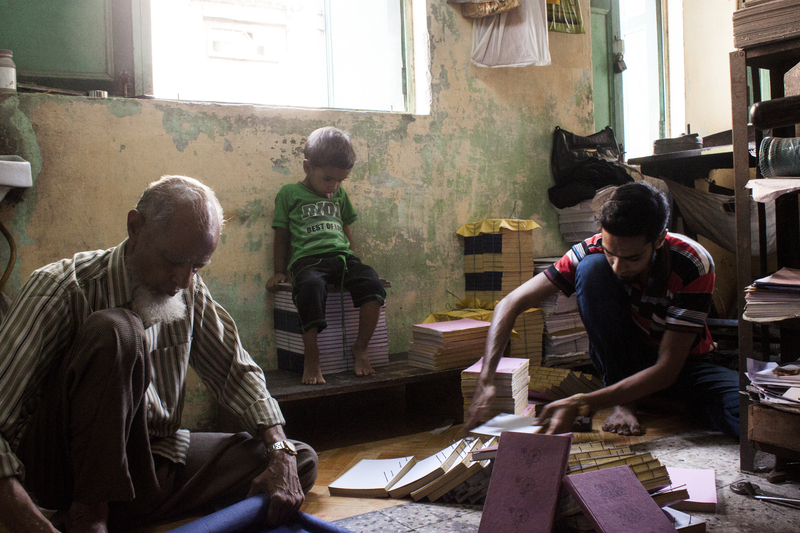 He mainly works on a registers and book bindings at a small box rise room at Khadiya bazar, old Ahmedabad. His passion of running family business has overpowered his educational qualification where he is keen to learn new techniques to add into their 3rd generation pedigree skillet. The journey starts with procuring beautiful textured handmade paper from Kalamkush, a place rich in Gandhian philosophy. Superfine re-used papers procured from the heart of Ahemdabad offer the best doodling experience. Both these materials achieve volume at Khadiya Bazar at the hands of our experienced book binders. With whole hearted follower of Quran, they respect the ways that saves the resources (material, energy and time). Their expertise into the field and resources saving nature are two major reasons why CC is forwarding with them.